West Indies have become the second team, after India, to win all three world tournaments conducted by the ICC - the World Cup (1975 and 1979), the Champions Trophy (2004) and the World Twenty20 (2012). They've also reached three other finals of ICC events. India won the World Cup in 2011, the World Twenty20 in 2007, and shared the Champions Trophy with Sri Lanka in 2002. In the Powerplay overs, West Indies scored only 14, which is the lowest for West Indies, and the lowest for any team against Sri Lanka. The previous-lowest for West Indies had been 17, against South Africa in the 2010 World Twenty20, while the previous-lowest by any side against Sri Lanka was also 17, by New Zealand in Lauderhill in 2010. The lowest Powerplay score by any team is 10, by Canada against Zimbabwe in 2008. In the last nine overs, though, West Indies scored 99, which is their fifth-highest in Twenty20 internationals. Their highest is 131, against New Zealand in Lauderhill earlier this year. West Indies also scored 122 - their second-best - in the last nine in the semi-finals of this tournament against Australia, which means two of their best five efforts have come in successive matches. 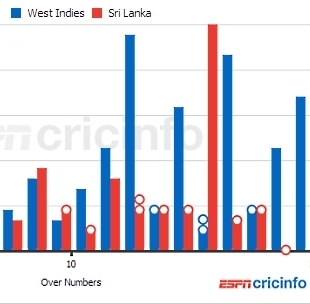 West Indies ended up scoring more runs in their last ten overs (105) than Sri Lanka did in their entire innings. Marlon Samuels' 78 is his highest score in Twenty20 internationals, and also the highest by any batsman in the final of a World Twenty20. The previous-highest was Gautam Gambhir's 75 in the 2007 final. Lasith Malinga went for 54 in his four overs, which is the most runs he has conceded in a Twenty20 international innings; it's also his worst economy rate in an innings in which he has bowled four overs. Malinga was hit for five sixes in the innings, all of them by Samuels. It's the most sixes he has conceded in a Twenty20 innings - his previous-highest was two. In fact, no batsman had hit him for more one six in an innings. In all, Malinga conceded 39 runs from 11 balls to Samuels, which is joint fifth-highest that any batsman has scored against a bowler in a match. The highest is 46 off 18 balls, by Chris Gayle off Brett Lee in the 2009 World Twenty20. The previous-highest against Malinga was 30 in 11, by Michael Hussey in the 2010 World Twenty20. Malinga had a terrible day, but two other spinners put in terrific performances. The figures for Ajantha Mendis (4 for 12 in four overs) and Sunil Narine (3 for 9 in 3.4 overs) are the two best figures in the final of World Twenty20 tournaments. The earlier best was Irfan Pathan's 3 for 16 in the 2007 final. Mendis also finished with 15 wickets in the tournament, the highest by any bowler in a World Twenty20. West Indies beat Sri Lanka in an international game for the first time since April 12, 2008, when they won an ODI in Port-of-Spain by seven wickets. Since then, they lost six matches and drew three against Sri Lanka. This was also West Indies' first win against Sri Lanka in a Twenty20 international. For Sri Lanka, this was their fourth successive defeat in the final of a world tournament, following on their defeats in the 2011 and 2007 50-over World Cups, and the 2009 World Twenty20.